Home / HORROR/SUSPENSE / TALK OF THE TOWN / Alien Abduction, a horror thriller from the producers of Hostel and Inglourious Basterds. Alien Abduction, a horror thriller from the producers of Hostel and Inglourious Basterds. Aliens used to abduct us all the time in the 1980s and 1990s. These days, it seemed like they had lost all interest in humanity… until now. 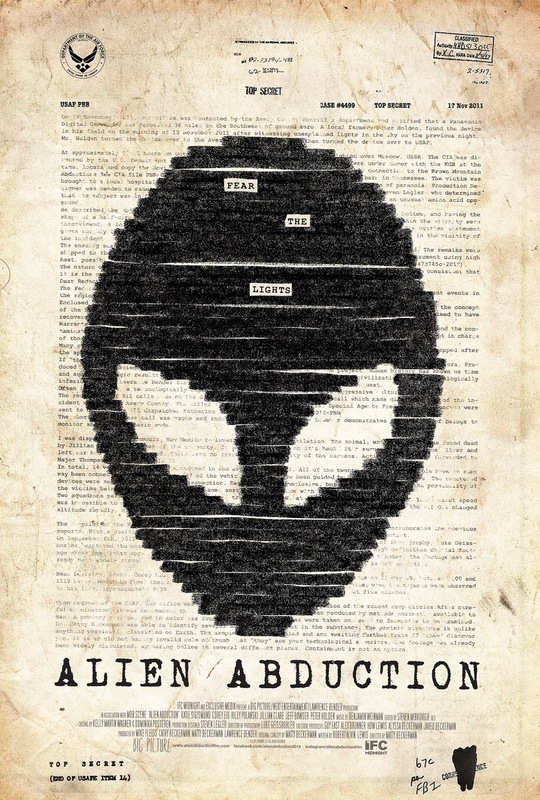 Captive Cinema is proud to premiere the creepy new Alien Abduction poster, from a film produced by Mike Fleiss (Hostel) and Lawrence Bender (Inglourious Basterds), and directed by Marty Beckerman. A terrifying sci-fi story inspired by dramatic found footage, "ALien Abduction" preys on our fear of the unknown as we follow an average American family who find themselves in the wrong place at the wrong time. While driving to a campsite in the Brown Mountains of North Carolina, the Morris family’s GPS malfunctions and they are led to a remote tunnel surrounded by abandoned vehicles. The father, Peter Morris, is abducted leaving his traumatized wife and children to flee and seek refuge in a nearby cabin. There they are horrified to learn that strange lights in the nearby mountains have been linked to alien abduction and human sacrifice for centuries. When their attempts to alert the authorities are intercepted by the deadly extraterrestrial threat, the surviving members of the family find themselves under siege. A brutal and bloody attack unfolds as we witness the horrors through the lens of the youngest child’s video camera. ‘’Alien Abduction” is released and distributed by Captive Cinema.